Wild Bergamot (Monarda Fistulosa), also called Bee Balm - early July. Take a closer look. The blossom on this Ozarks native wildflower is actually an inflorescence (a cluster of flowers), instead of single flower. The individual flowers and the center of the cluster are loaded with nectar, making this a popular feeding station for bees and hummingbirds. 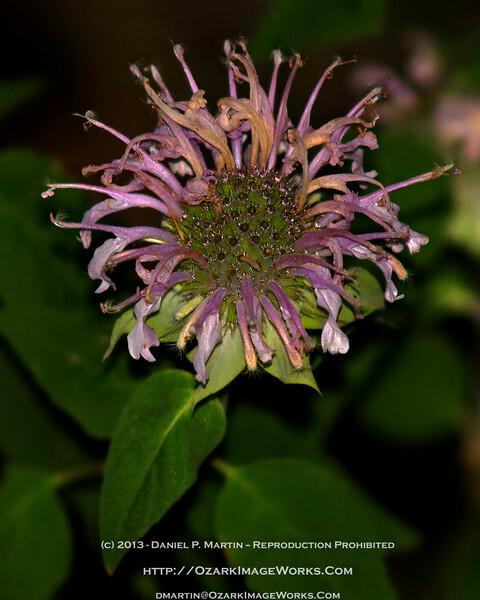 Members of the Monarda genus are found throughout North America. M. fistulosa appears in a number of different varieties, some common and some quite rare. This variant has appeared during early summertime in Madison County for as long as I can recall.